My secret project is revealed! Water is a big problem out here in the desert of Tucson. A well would cost me $30,000 and I don't have that kind of money. My goal is to collect rainwater but right now I don't have any gutters since I had my old garage demolished. When my excavator guy was out here making a pad for the barn-shed, he had a water truck come out to keep the dust down. That gave me an idea. He said the truckload of non-potable water costs $150 and it can hold 3,500 gallons. 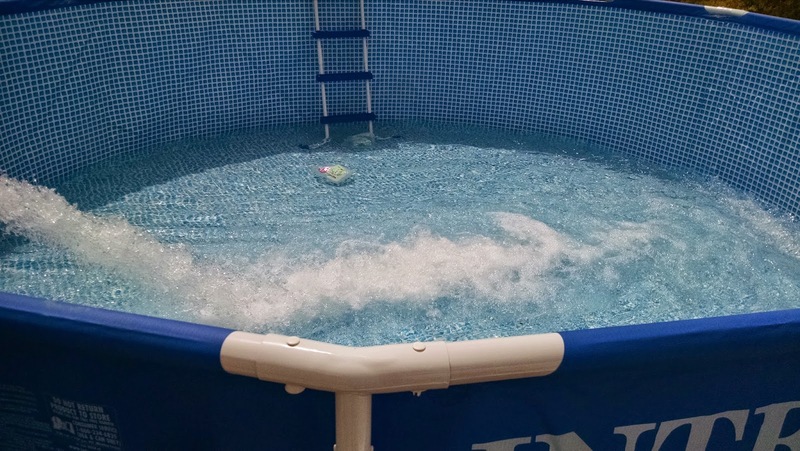 Water tanks are a few thousand dollars which I don't have and I needed something fast, so I thought, why not a pool? I picked out a pool that is 15' diameter and 48" high. It holds 4,200 gallons. 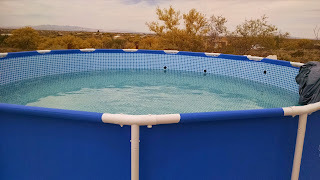 I needed the 48" height to comply with the Pima County rules for pool fences. 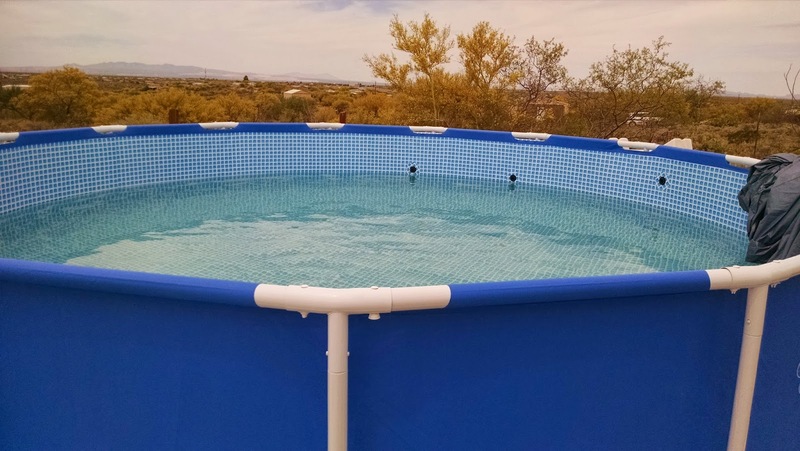 For above ground pools, if they are 48" then no additional fencing is required, I just have to lock up the pool ladder. I bought styrofoam sheets to protect the pool liner. 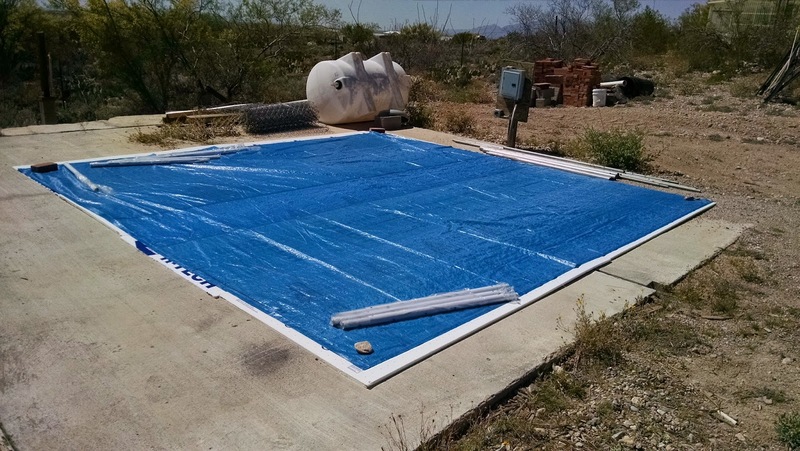 The pool came with a flimsy tarp to use as the base. My niece and I set it up on the old garage slab. The water truck arrived on my birthday, just like I had planned. It was great to see it fill. I wanted to jump in. It wasn't quite enough water to reach the pool filter holes but that's ok. I will be relying on chlorine and the pool cover to keep it clean. So, I have 3,500 gallons in my temporary reservoir. I am hoping the pool lasts for 2 years. It cost $350 plus $150 for the water. When I get my gutters set up, I will use the pool for any water overflow. If I don't need to have water delivered again, this project will have cost me $21/m for the next 2 years plus the cost of chlorine and probably a replacement pool cover when it wears out. If I buy 3500 gallons next year too, my cost will be $27/m. This water will be filtered and moved to the water tanks connected to the house as needed. The kitchen faucet has a Brita filter on it for filling the dogs' water. I will continue to buy bottled drinking water for me and my nephew. He prefers Arrowhead while I am content with the cheapest generic water. I rarely drink plain water, mainly I use it for cooking. I am happy to have my water problem solved for the moment. I hope it won't spring a leak or anything. Now I need to get those other water tanks connected to the house. My bathroom plumbing is going slowly but I did buy the correct connector hose for the toilet. The one for the sink faucet was the wrong size so it is back to the store for an exchange and then on to the next project which is hooking up the water pump, water heater and water tanks. It is slow going but there is actual progress every week so someday it will be finished. Very inventive, hope it works out for you. So this is only for water storage and not for splashing around in, right? I bet you will be very tempted to jump in on really hot days. That's a very creative economical solution. Also I have often seen second hand above ground pools advertised very cheap or free (if you dismantle and pickup). I will consider this for a garden tank on my property. I would be straight in there, in my swimsuit. Very investive! Thanks, squire, hopefully it won't spring a leak. I think I would cry. Dave, I think I have to get in at least once. June is right around the corner and so are the 100 degree temps. I had actually planned to swim in it but so far I've just been too busy with the mobile home. Yes, George G, I see a lot of used pools on craigslist in the fall. I was willing to buy a new one because I think the Arizona sun is very hard on them. If it lasts me 2 years I will be happy. If I was looking for a pool for swimming I probably would have tried a used one. Lizzie, even though the neighbors aren't close, I feel like they would all be watching me. I'll probably go in with board shorts and a t-shirt. Plus, I don't want a lot of sunscreen in my water supply so no bikini for me. Daizy, another source to get an above-the-ground pool cheap is to do what my parents did back in the 1970s - buy a floor model on display at a pool store. They bought it at a big discount. I don't think you want to be drinking or cooking with water you or someone else has bathed in, even with a good filtration system. Doesn't that trigger a big "EW!"? Daizy, if we can't join you at your pool party, can we get some pictures of the gala event? Eww...I won't be drinking it. I will filter is for the dogs to drink though. I have a particle filter, a charcoal filter and another filter that is attached to the faucet. What a great idea with the pool! I seriously don't know how you didn't jump in it though! Dobermom, I had too much to do that day and now the bees and wasps are very interested in the water. I'm still working on getting it covered.